The perfect weekend in nature. Come stay in one of our beautiful 4-meter Luxury canvas bell tents. Fitted out with everything you need for a cosy getaway under the stars. 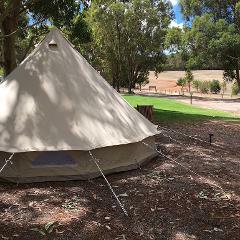 Any campsite in the Margaret River Region. The perfect weekend in nature. Come stay in one of our beautiful 5-meter Luxury canvas bell tents. Fitted out with everything you need for a cosy getaway under the stars. 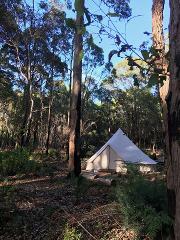 Your choice of campsite in the Margaret River Region. Wild Goose Camp-out! 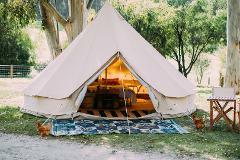 4 meter Luxury Furnished Canvas bell tent for two. ONLY 6 AVAILABLE. Wild Goose Camp-out! 5 meter Luxury Furnished Canvas bell tent. ONLY 6 AVAILABLE.